Dena Ferrara Driscoll bikes regularly with her family. She believes that Philly needs to do more to protect riders and avoid tragedies like Monday’s deadly accident at 11th and Spruce Streets. On Wednesday morning, I left my home, placed my preschooler on the back of my bicycle, and met hundreds of other people at 11th and Spruce Streets in order to physically protect the Spruce Street bike lane. We stood shoulder to shoulder to form a human wall to separate people on bikes from the cars on the street. While I often bike this very route with my preschooler, we rarely step in to protect our fellow commuters. However, earlier this week, Emily C. Fredricks, a 24-year-old woman on her way to work, was killed by a private trash truck while riding in this unprotected bike lane. It was time for us to step in, when our city and our elected officials have refused to do so. The buffered bike lanes on Spruce and Pine Streets stretch from river to river and are two of the busiest bike lanes in Philadelphia. The lanes were a campaign promise made by former Mayor Michael Nutter in 2007, installed as a temporary pilot in 2009, and made permanent the following year. At the time, these lanes were seen as groundbreaking in the United States. Since then, cities around the U.S. have not only installed buffered lanes but also protected bike lanes, which are the pinnacle of safety because they create a plastic physical barrier between cyclists and cars. When Mayor Kenney ran for office, he promised voters that he would install 30 miles of protected bike lanes in Philadelphia. (For reference, 30 miles is about 1 percent of all Philadelphia streets.) Currently he has completed two small segments. While thousands of riders have taken advantage of the Spruce and Pine bike lanes, Philly's per capita spending on street maintenance has steadily declined over the last nine years. Today Mayor Kenney's streets budget, even with an increase this year, is lower than the budget when Mayor Nutter took office. It is a very familiar story to many Philadelphia bikers that the Pine and Spruce Streets surfaces have seen very little upkeep in the last decade. Painted bike-lane lines have faded to oblivion on many of the blocks, potholes fill the lanes, and the bike lane remains unprotected. This deferred street maintenance has continued to cause unsafe behaviors and streets for both car drivers and people on bikes. This was particularly noticeable to my family during the Democratic National Convention in 2016, when out-of-town visitors kept driving in the bike lane because they could not identify it as a bike lane. I stopped riding my bike that week because I worried for my own life and my children's lives. In short: Emily C. Fredricks' death is tragic, but it isn't surprising to safe streets advocates. Not enough has been done to keep these bike lanes safe and someone was bound get hurt. Protesters advocate for safer bike lanes by lining up at 11th and Spruce Streets. Unlike many of our neighborhood streets, Spruce and Pine have earmarked grant funding to improve them for safer mobility — including funds for re-striping and installation of flexi-posts to separate the bike lanes from car traffic. However, before that money can be spent, we need our local Council people on board. Mark Squilla and Kenyatta Johnson have final say on bike lanes in their districts — Spruce and Pine run through both — but they often cede that power not to the city Office of Transportation and Infrastructure Systems' team of expert planners and engineers, but to a select group of citizens and powerful residential associations who, at many contentious meetings about protected bike lanes, have demanded the convenience of using the bike lane as a de facto loading zone for their cars. This is something most Philadelphians do not get the privilege of doing on the streets where their homes are located. We cannot allow our Council people to "pass the buck" when they demanded as part of the Complete Streets bill to have final say for street design. As a mother, resident of Philadelphia, and person who rides a bike, I call on Councilmen Squilla and Johnson as well as Mayor Kenney to spend the grant funding with a six-week, six-month, and one-year action plan. Within six weeks, we need to see the streets re-striped on Spruce and Pine, within six months the installation of flexi-posts for a one-year trial, at the one-year mark evaluate the successes and failures of the lanes, and improve them to make them safer. While today we honored the memory of Emily C. Fredricks by using our own bodies to protect our neighbors, we need the city to step in and protect all of us, all the time. 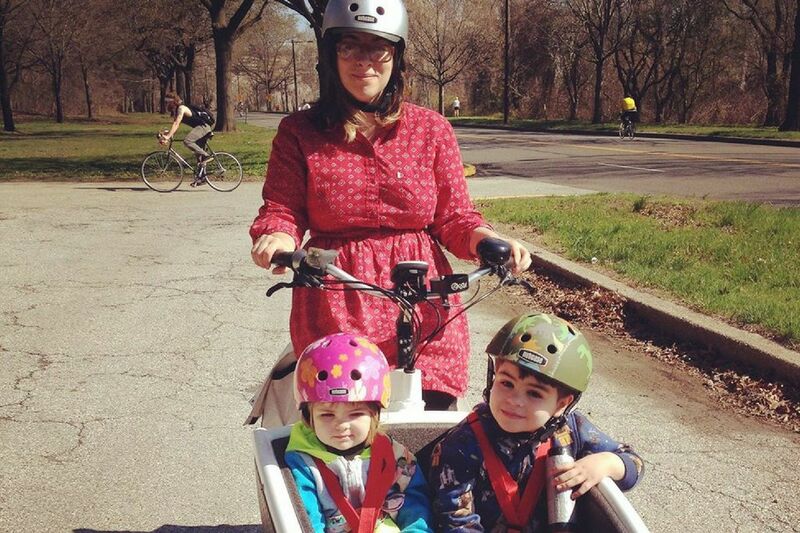 Dena Ferrara Driscoll is a family biking advocate who co-chairs 5th Square PAC. You can reach her on Twitter @bikemamadelphia.